Refill the hole to within about 10 inches of the top level of soil. Add 2 inches of compost and mix the soil and compost until 50 percent is soil and 50 percent is compost. With the compost, the soil in your hole should be around 8 inches below the surrounding soil levels. Lay your rhizomes eyes up and cover them with 8 inches of soil. Add 2 to 3 inches of mulch and water your bamboo rhizomes with 4 to 6 inches of water initially. The bamboo genus Phyllostachys, which consists of about 60 species, all of which are edible, is well-suited for cultivation in the United States. Some of these species include P. dulcis, P. edulis, P. bambusoides, P. pubescens, P. nuda, and P. viridis. 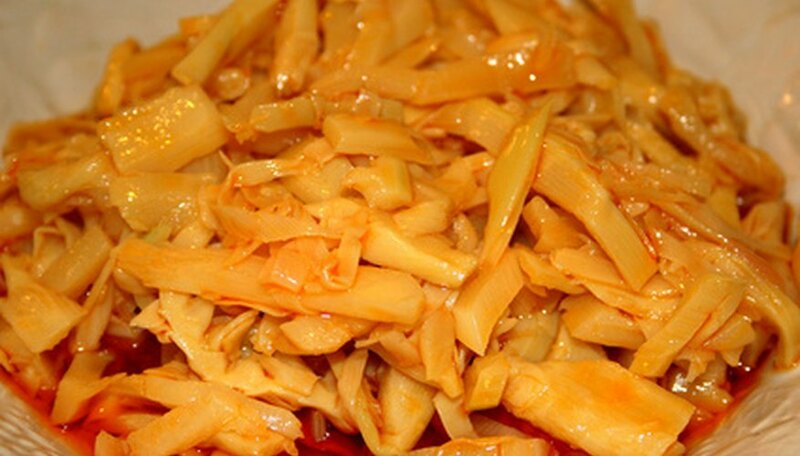 The USDA recommends boiling fresh bamboo shoots for 18 to 20 minutes before eating them. Washington State University: What Are Bamboo Shoots?